On behalf of the Independent Trade Union of Miners of Ukraine, I want to share the update information about female employees hunger strike in Donetsk region. In the Donetsk region, three female employees of the coal mine ‘Kurakhivska’ of the state-owned enterprise “Selydivvugillya” are continuing their hunger strike against wage arrears. As it was informed before, on 2 January four employees of the SOE “Selydivvugillya” started hunger strike because they did not receive wages for September, October, November and December, as well as part of the salary for June. According to the Chairperson of the Confederation of Free trade Unions of Ukraine and the Independent Trade Union of Miners of Ukraine Mykhailo Volynets, the protest action of the workers of the non-industrial group SE “Selidivugollya” began on 17th December and as it didn’t bring any results, four employees decided to start a hunger strike. “The administration of the company, along with the heads of the Ministry of Energy and Coal Industry, managed to pay some part of wages to the employees. For example, one of the participants of the protest Natalia Mnednikova got 2400 UAH ($87), while the monthly salary for female protesters amounts to 3000-3200 UAH ($109-116). The product prices are quite at the same level as in European countries. Some employees of a non-industrial group of the SOE “Selydivvugillya” are single mothers and in some cases, all adults family members work at this enterprise. I would like to remind that employees of the non-industrial group SOE “Selidovugollya” haven’t got 30% of wages for September and wages for October, November and December 2018. Also, there are wage arrears for previous years, including for underground workers”. Mykhailo Volynets told that four female protesters held their protest on Christmas Eve (in Ukraine most orthodox Christians celebrate Christmas on 7 January) and sleep on mattresses in cold room last night. “There is cold weather in Donetsk region and its -6 C outside. In the room where protesters are holding a hunger strike is cold. One of the protesters Ms Iryna Strykalova felt ill. The doctors said that she can have flue due to unhealthy conditions in room or flu and insisted on ending her hunger strike. Other participants of the action also have some health problems. Maya Lewandowska has high blood pressure and cardiac angina. She got medical assistance’. 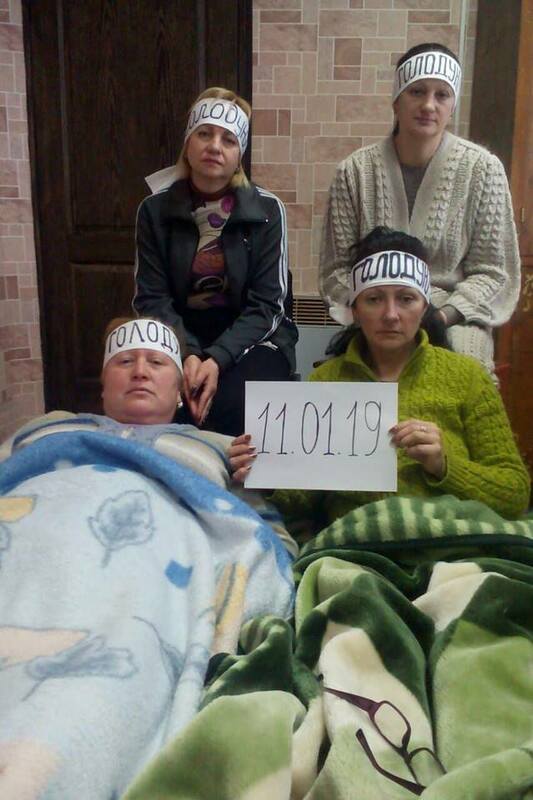 As for today afternoon, three female employees of the state-owned enterprise “Selydivvugillya” are continuing their hunger strike against wage arrears: Maya Lewandowska, Natalia Mednikova, and Kateryna Bogdan.